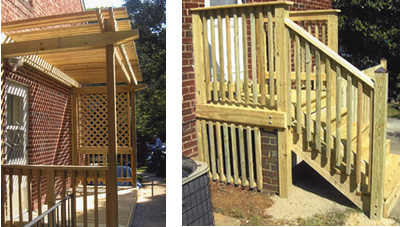 Two projects for different homeowners both involving the rear entrance ways into their homes. For a family on Seminary Road a new set of stairs to reach their door and also a gate and fence to surround the stairs leading to their basement entrance. All construction from pressure treated lumber. the other entrance way was a covered porch with the entrance leading into their Kitchen. Lattice work sides and the large deck on the porch was a nice improvement and added ease of use to their barbecue area in their backyard.